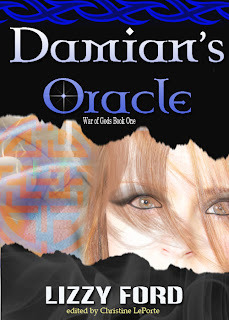 "Sofia begins her transformation from human into oracle, the first in thousands of years. Damian rescues her from the Black God in time to complete a ceremony that will bind her to him for eternity. Sofia struggles with her new world and her role as an oracle and Damian’s mate while haunted by a mysterious man from Damian’s past who’s supposed to be dead." "Inspired by Slavic mythology, Damien’s Oracle is the entree into the ongoing battle between good and evil over the fate of humanity. The White God, Damian, and his Guardians protect the world from the Black God and his monsters while rescuing Naturals – humans with extraordinary paranormal gifts - from the Black God, who would kill or convert them. While he wants nothing more than for the petite beauty to take her place at his side like the oracles of legend did his White God forefathers, Damian can’t quite rationalize having to win her over instead of command her. Further complicating his life is the sobering realization that there are spies in his organization who are helping the Black God take out his Guardians. Damian must help Sofia reach her potential fast, especially when a threat from his past returns." I liked the plot, the world that was being created, I liked the mythology and definitely the divine spirits and Guardians. It was a story that was easy to read as the action sequences kept the story going, but the beginning was hard to get. What drew me off a little was the male lead's excessive cursing, sort of without sufficient emotional build up, but other than that very little of this book disturbed me. I liked Sofia she was entertaining to read, she kept a good head on her shoulders and I felt she was relatable. I would have hoped she would have been bit more skeptical of the situation she was thrown in. The book had a distinct feeling of YA to it. The cover needs a make-over to attract readers, the color schemes don't match, the make-up and the font needs little tweaking - the cover doesn't give credit that the story warrants. You'll like this if... you're into mythology, like character driven books and like your heroes God-like, little aloof and arrogant, but in a good way.